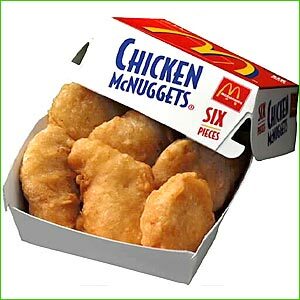 There’s something about chicken nuggets that children love and food purists really hate. Since McDonald’s came out with the McNugget worldwide in 1983 and created the category, critics of the modern food system have repeatedly jumped on the fact that nuggets are not exactly health food. “When it comes to childhood nutrition, few foods are as unhealthy and insidious as the chicken nugget,” Tara Parker Pope wrote in the Wall Street Journal in 2004. Is this what’s making Mississippi fat? A blog posting on that theme made the rounds a few years ago, supported by an authentic video showing the production of mechanically separated poultry (MSP), which consists of bits of meat squeezed off the frames (bone structures) of turkeys and chickens. The resulting paste-like product is used in frankfurters and other “pegboard” products but is not typically used in nuggets. But the blog insisted not only that MSP is used in nuggets, but it is treated with ammonia to kill germs – which is also untrue. Everything is seemingly spinning out of control at The Washington Post. I am dizzy from reading Wednesday’s paper (4/17/2013). Can’t believe it. In foreign news, and on the front page no less, is an article stating that national regulation of the economy in France is out of control. Why, the article even cites criticism of the Precautionary Principle, the rule which basically states that you can’t do anything for the first time. It is used to stifle innovation in Europe and is a cardinal principle of the reactionary left. To see it cavalierly dismissed in the Washington Post is quite a shock. The State Farm insurance company is spending millions of dollars on TV dramatizing the difference between State Farm and a certain unnamed insurance company that makes you call a toll-free number to report an accident. The guy in the ad with his car up a phone call calls his (former) agent, Jessica, and says that while it took only 15 minutes to switch insurance companies, it take a lot longer to get some help. As a State Farm customer for many years, I’ve appreciated the fact that I really could call my local agent and get help pronto. We had a little accident a few years ago and called the agent’s office at ten minutes to five. Presto, all was taken care of. Every so often, one of the major political parties goes off the deep end and nominates someone for president who has absolutely no chance of winning. The Republicans did it with Barry Goldwater in 1964 and the Democrats with George McGovern in 1972. The Republican faithful now seem inclined to do it again with Newt Gingrich. Gingrich has leaped ahead of Mitt Romney in the latest NBC News/Wall Street Journal poll, with 37 percent of likely GOP primary voters backing the ex-House speaker and Washington power broker, against only 28 percent supporting the ex-Massachusetts governor and hedge fund multimillionaire.